March 15, 2017 (Tulsa, Okla.) Philbrook announces EDGE 2017, which launches expanded use of the Philbrook Gardens. The biennial fundraising weekend offers patrons and ticketholders a sneak peek into the vision of newly appointed Philbrook Director Scott Stulen, who plans to deepen the offerings and impact of the 25-acre midtown Tulsa location. 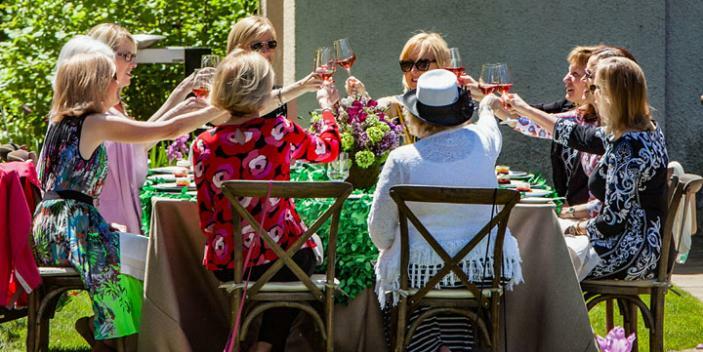 Patron packages include a garden wine luncheon on Monday, April 24 as well as tickets to the Saturday, April 22 Route 66 Garden “takeover” party featuring local food, beer, wine, and music. All proceeds benefit Philbrook Museum of Art, a privately funded, general art museum nationally known for compelling and innovative experiences. This, the second biennial EDGE event offers patrons and corporate sponsors a private wine luncheon on the South Lawn amidst the spring bloom following a chat between Stulen and nationally recognized artists Chris Kallmyer and Karl Unnasch as well as author Matthew Gavin Frank about the future of the Philbrook Gardens. A geodesic dome created by Kallmyer will crown the newly planted Philbrook garden of edibles on the southeast edge of the property near some recently installed beehives. The hives will yield local honey for sale in the Museum shop and support a natural pollination process. Philbrook recently commissioned Unnasch to create an original cabin structure featuring stained glass windows on the historic Midtown Tulsa property that will be used for classroom space, private events, and moments of tranquility. Unnasch and Stulen will preview the cabin, which is scheduled to be finished in 2018, and discuss the inspiration behind its unique design. In addition, Kallmyer, a sound artist, will take patrons and guests on a journey of the senses through a cheese tasting experience unlike any seen in Tulsa. Guests will also enjoy wine from local wineries Pecan Creek and Tidewater, as well as local beer and local music. Tickets to the Route 66 Garden Party are included with EDGE patron packages or $75 ($66 for Philbrook Members). All proceeds of EDGE benefit Philbrook educational programming and Museum operations including programs like Second Saturdays, which offers free admission and activities on the second Saturday of each month, Art Focus in collaboration with the Alzheimer’s’ Association and MyMuseum Mobile, which brings together Philbrook, the Junior League of Tulsa, and the Children’s Hospital at Saint Francis, among others. Led by chair Becky Dixon, the volunteer EDGE committee includes: Susannah Adelson, Nancy Bolzle, Mary Quinn Cooper, Erin Donovan, Jean Foutch, Marci Johnson, Jeanette Kern, April McAnnally, Cathy Moore, and Susan Thomas. “I treasure everything Philbrook represents to our city, and it’s always the first place I take out of town visitors. In addition to the museum and its beautiful gardens, I especially value the diverse programs that serve the entire community,” reflected Dixon. Philbrook EDGE began in 2015 as a modern take on a traditional garden fundraising event. That inaugural event broke revenue projections raising over a quarter million dollars to benefit Philbrook and sell-out crowd. Even more impressively, two-thirds of those who supported the event were new donors to the Museum, affirming the freshness of this event among fundraisers in Tulsa. For additional information on Philbrook EDGE, visit philbrook.org/EDGE. Rooted in the beauty and architecture of an historic home gifted by the Phillips family 75 years ago, Philbrook Museum of Art has grown to become one of the preeminent art museums across the central United States. Highlights of the Museum’s permanent collection include Renaissance and Baroque paintings from the Kress Foundation, one of the greatest surveys of Native American art anywhere, and growing modern and contemporary collections. Philbrook’s American art collection includes, among others, works by William Merritt Chase, Alexandre Hogue, and Asher B. Durand.